Pins are visual bookmarks for user interests. Pinterest is a site for storing and organizing these pins. It also helps to discover new pins based on user interests. Pinterest connects people based on their shared interests. Pinterest api integration into your site helps to add your site content as visitors pins your content to their pinterest account. Quintet offers pinterest integration with your website or mobile applications. Proper use of the pinterest api features increases your content viewers count and hence more publicity. This is one of the ways you can get the marketing advantage of Pinterest. 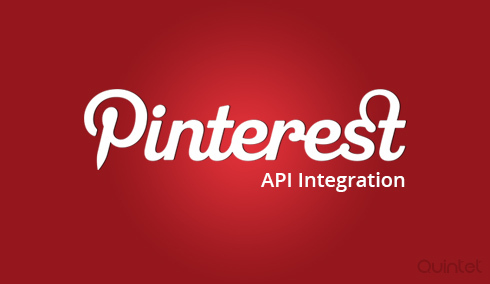 Pinterest offers pin it button implementation with their api. Pin it button bookmarks selected content to users pinterest account. Our developers are ready for including the pin it button as a part of your website. After the integration of pin it button in your website it will help visitors to add your content to their pinterest account. This will increases the flow of website contents through visitors and their friends pinterest account. Pinterest supports pin it button integration in android applications also. Our team of api experts can do any work related to Pinterest API. Android pin it integration helps android app users to share the content directly to their pinterest account from the app interface. Quintet have a bunch of great Android developers who have expertise in various fields including third party API integration. On hover pin it button is a pin it button over an image, and it is visible only when someone mouseover the image. We make properly aligned pin it button to users websites. It helps easy bookmarking of images with one single click. It may be a simple idea, but can make a lot of difference in the visual UI. Pinterest supports pin it button with iphone applications. iOS pin it button helps to share iphone application content to users pinterest account without any interruption on the app usage. Quintet has more than 5 years of experience in developing iOS applications. Our iOS developers keep themselves updated with all the latest updates in iOS versions and API integration. Pinterest provides pinterest details with the domain api methods. Domain api methods gives most recent, most clicked, most popular and related pins. Related pins show pins similar to your pin. It increases users visit through your pins and related pins. User can include recommendations or suggestions to your websites using these domain api methods. Pinterest’s rich pin includes some useful content with the pin. Rich pin category includes product, recipe, movie, article and place. Recipe pin can add ingredient details and movie pin can add movie reviews or any data related to pin type. All these features enhance your content look and will help you to bring more and more visitors to your page eventually. Google Plus is a social networking site under google Inc and its also one of the largest, having millions of daily users. Google Plus api gives google plus details through api calls and it uses authorization based data retrieval. Quintet provides fast and easy implementation techniques with google plus api.